BIO: Professor Timothy Mousseau received his doctoral degree in 1988 from McGill University and completed a NSERC (Canada) postdoctoral fellowship in population biology at the University of California, Davis. He joined the Faculty at the University of South Carolina in 1991 and is currently the Associate Vice President for Research and Graduate Education, the Dean of the Graduate School (Interim), and a Professor in the Department of Biological Sciences in the College of Arts & Sciences. Since 1999, Professor Mousseau and his collaborators (esp. 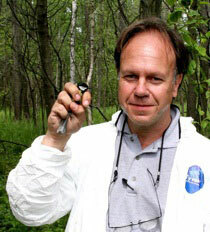 Dr. Anders Pape Møller, University of Paris-Sud) have explored the ecological and evolutionary consequences of the radioactive contaminants affecting populations of birds, insects and people inhabiting the Chernobyl region of Ukraine. Their research suggests that many species of plants and animals suffer from increased mutational loads as a result of exposure to radionuclides stemming from the Chernobyl disaster. In some species (e.g. the barn swallow, Hirundo rustica), this mutational load has had dramatic consequences for reproduction and survival. Prof Mousseau’s current research is aimed at elucidating the causes of variation among different species in their apparent sensitivity to radionuclide exposure. For enquiries and appointments with the guest speaker, please email John Endler.